Apple products are so good-looking, they act as an integral as part of the interior design of your home. That seems to be the idea, at least, behind a photo spread in October’s Casa Amica, monthly design supplement to Italian daily Corriere della Sera. 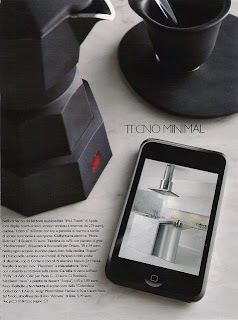 The Italians call it a “tecno minimal” look (click on photo for larger view), where your iPod Touch is the perfect complement to the gres coffee cups. You, minimalist homeowner, sip espresso while ogling an aluminum and marble Doimo kitchen from the screen. 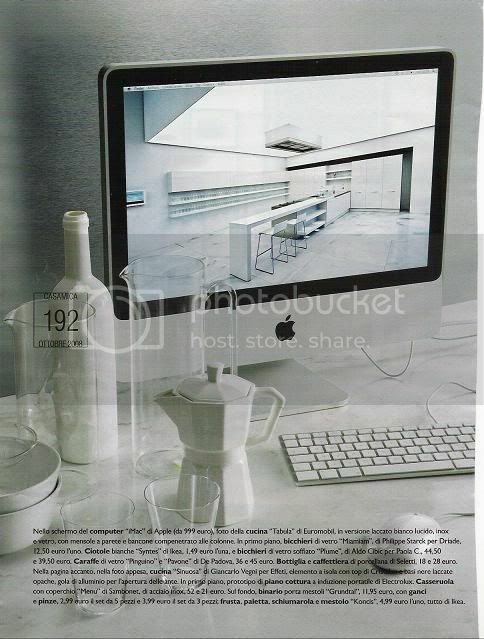 Or browse for a new kitchen with your iMac, perhaps this one with a slightly institutional feel, probably distracted by the lovely Philippe Starck glasses for Driade on your counter top. Click "Read More" to view the ipod as home accessory.